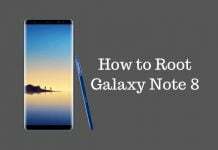 Samsung Galaxy Note 8 is going to be official on Aug. 23 and the company seems to be testing the device before its debut. The Galaxy Note 8 has now appeared on GFXBench benchmarking to show off its killer specs. 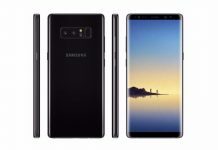 The GFXBench listing of the Samsung Galaxy Note 8 states that it is driven by Exynos 8895 chipset that includes a 2.3 GHz octa-core processor and ARM Mali-G71 graphics. Highly reliable tipster, Evan Blass has revealed that the Exynos 8895 powered Note 8 will be the international variant of the phablet that will come to markets outside of the U.S. The stateside is expected to get Snapdragon 835 powered Galaxy Note 8. The Galaxy Note 8 GFXBench listing states that it features a 6.4-inch display that supports a QHD+ resolution of 2,960 x 1,440 pixels. 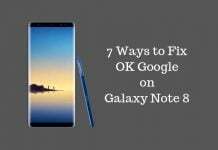 However, recent rumors have stated that the Note 8 would be coming with a 6.3-inch QHD+ display. The correct size of its display will be known when it will be officially unveiled in the coming week. 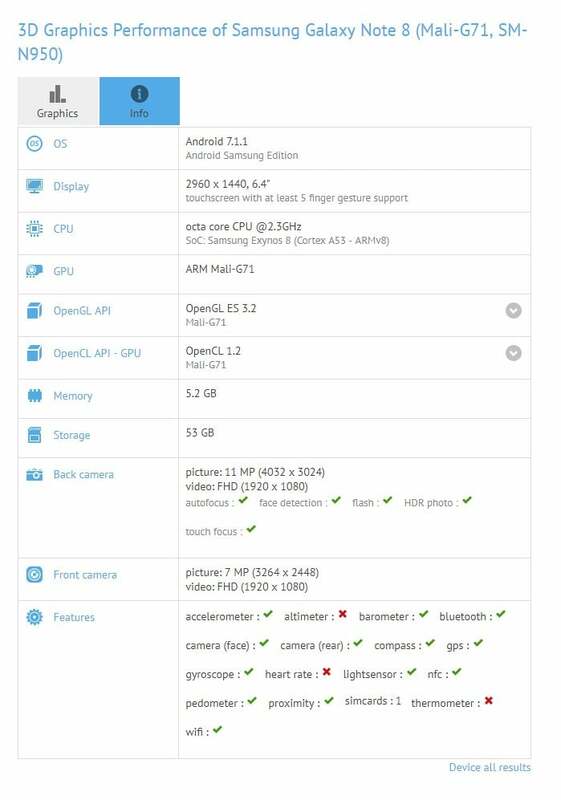 The GFXBench listing usually does not mention the details of the second camera of the dual camera system. The Galaxy Note 8 is expected to come with a pair of 12-megapixel rear cameras, but the benchmarking site says that it features a single 12-megapixel sensor. The frontside features a selfie snapper of 8-megapixel and it will be coming with Android 7.1 Nougat preinstalled. It is likely to be one of the first Samsung smartphones to be blessed with the upcoming Android 8.0 update. Blass has previously revealed that the Galaxy Note 8 will be coming with an S-Pen stylus and a 3,300mAh battery with fast charging capabilities. It will be sporting an IP68 certified chassis and will be available in colors like Midnight Black, Maple Gold, Orchid Gray and Deep Sea Blue. 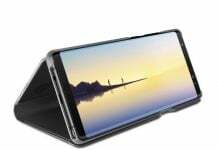 Samsung has a couple of dual rear camera totting smartphones under the wraps such as Galaxy J7 (2017) Chinese version, Galaxy C7 (2017) and Galaxy C10. However, the Galaxy Note 8 that is going to debut next week will arrive as Samsung’s first dual rear camera totting smartphone. The U.S., the U.K. and South Korea are the first countries to get the Galaxy Note 8 in September. The other markets are scheduled to get the device in October. It is expected to arrive with a pricing of 1,100 euros ($1,175).